I shared this craft a while ago when I was still Cox's Corner and I STILL LOVE it! I had been wanting to make it for a while and I finally got around to it! The tutorial is super brief. If you don't have a silhouette (other than the writing) the mickey and mustache should be super easy to cut out by hand. The writing can still be cut out...it just won't be as easy. I just chose which designs I wanted. 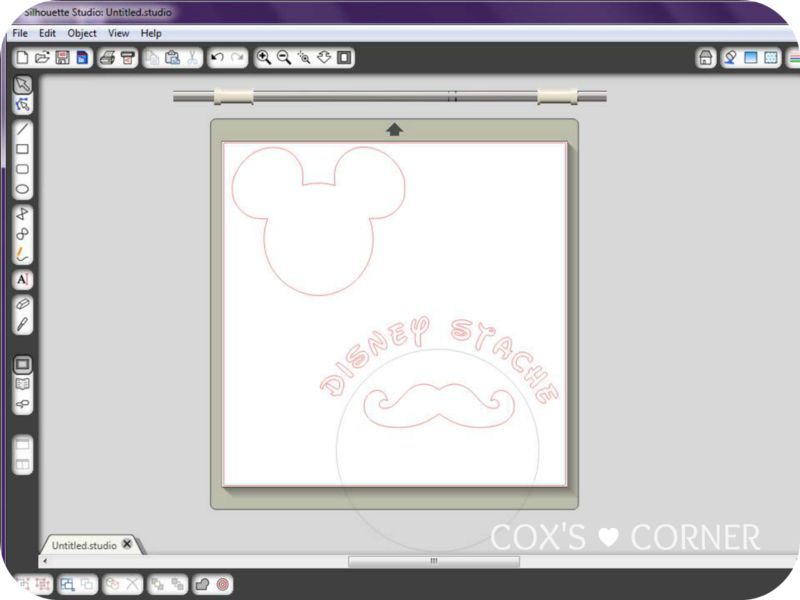 I traced the mickey silhouette to make the mickey head and I just used a mustache shape I bought from the silhouette store. For the font I used "waltograph" which is a free download and shaped it by following this tutorial. I placed my vinyl onto my cutting mat in the correct places. Black where the Mickey Head is and turquoise where the writing and mustache is. I then applied my vinyl to my jar. One thing I learned about applying vinyl to glass jars is...holy air bubbles! Start from the middle and work your way out on each design. Don't put it all on at once and then rub it in...unless you want to spend the next five minutes popping air bubbles...not speaking from experience or anything! This was seriously such a quick project to put together and I'm thrilled with the results! Have I mentioned that my hubby is amazing?! Well he is! :) We went on a Disney Cruise on our Honeymoon and it was TO.DIE.FOR. We were hooked! A few months after PJ's first birthday I got the cruise bug and talked my sweet hubby into it and we went again as a family of 3. I've had the cruise bug ever since...but unfortunately we haven't really had the cash to provide the cure! I came to the conclusion that I need a reward, an awesome one for when I lose my 100 pounds...and well, we can't just go on a cruise to cruise because we don't have money to spend like that. That's when it hit me! The cruise can be my reward for losing 100 pounds! And then, when I reach my goal weight we could go on another one! All throughout our cruise with PJ people kept telling us how brave we are. I'd like to say brave, no. Prepared, yes! I shared the post on tips to cruise with toddlers here. If you have any questions you'd like addressed in a follow up post...please feel free to post them here! I love it! What a great idea to keep the motivation. And what a fun jar! My SIL and I are wanting to make something similar for an upcoming Disney trip. This is seriously such a fun take on it. I wish you good luck in your goal. I believe in you!! Not being able to exercise like you want is hard, but there is so much you can do not on your feet! You'll do great! That jar is darling - I pinned it! I've been wanting to go on a Disney cruise for years! Maybe I need to make a goal, too. You can do it! WOw, what a great project, and very rewarding! I have been working on losing weight as well. I have lost 38 pounds, and have another five to go... Good luck, you can do it! I am glad we found eachother on the CBC! Thank you! I'm so excited that it turned out how I wanted it to! Thank you so much for your support! Thanks Tiffany! Aren't cruises the best?! Thank you Kimberly! I appreciate your support! Thank you! I totally appreciate the pin! Disney Cruises are AMAZING! After our honeymoom cruise, I was hooked! You definitely should go! Thanks Kadie! They ARE wonderful! You should totally go sometime! Thank you! That is so awesome that you're close to your goal! Keep it up girl! I'm so glad you stopped by! Thank you! Maybe you could convince your hubby because of the Disney experience of it! It's to die for! So adorable. My kids are always wanting to save for Legos, maybe I could design a jar for their Lego "stache". Such a cute idea, thanks! And keep up the good work with your weight loss, you're inspiring! Thank you! I bet you could totally do something similar! Maybe with the lego man with a mustache or something along those lines! I love the jar! You are a clever one! I love Disney! I'm 27 years old & without a doubt Beauty & the Beast will always be my favorite movie! The girls I work with are going to be evil queens for Halloween. I hope you have a great Monday! This is so cute! And good luck with the weight loss. Cute way to save up for the Disney cruise and good luck on the weight loss! It's such a blessing to have a great doctor supporting you. I think I need to make a similar "stache" jar to save up for a Silhouette. There are so many great ideas out there using them! How cute is that?! I love that idea. 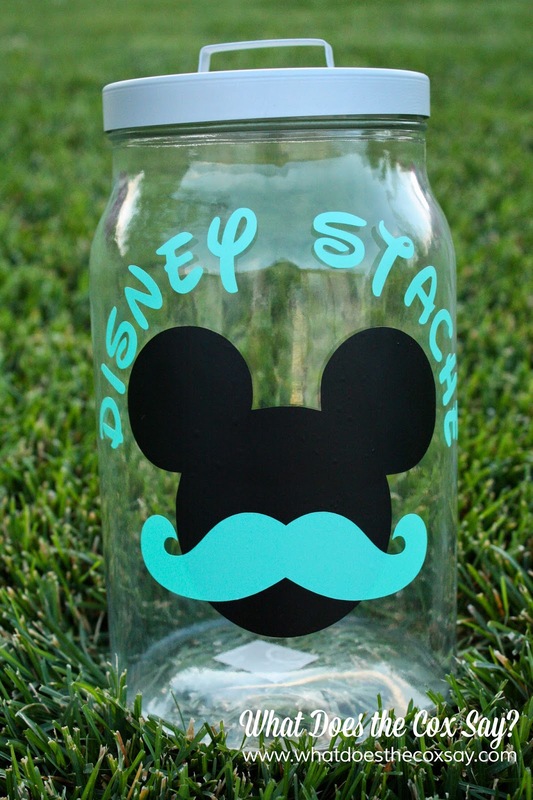 I recently made a "candy stache" jar, but a "disney stache" jar is such a cute and creative idea! Thank you! I'm loving the mustache trend and was looking for creative uses for it, and that one popped into my mind! I'm really happy with how it turned out! I absolutely LOVE my Silhouette, it has been an incredible investment and makes projects a breeze! Thank you April! I appreciate your support! I love Disney too! I love all of the movies, but like you, Beauty and the Beast is at the top of my list! I would love if you would guest post on my site with your Disney Cruise Survival Post when you get it done. Of course, maybe I can do a top 5 tips for your blog and send them over here if they want to see more! Awesome project but even better, way to go in placing a weight goal! Aww! Thanks Jill! I definitely want to do what's best for me and my sweet family those most. I don't want them to miss out on anything! Thanks for hosting the party! I'm hosting my very first one...so if you ever want to link up, you're more than welcome to! Thanks Jen! I'm so glad that you stopped by. Thank you so much for your support! That is so stinking cute! Disney cruises are seriously the funnest things in the world. Good luck on the weight loss goal! That's fantastic...I know you can do it!! AND, I love this cute little Disney Stache jar :o) Great motivator!! Sounds like an excellent motivator! We want on a Disney Cruise two years ago and it was an incredible experience. I hope you will keep us all updated on your progress as it's wonderful inspiration for the rest of us :) Thanks so much for sharing at Mom On Timeout! Aren't Disney Cruises the best things EVER?! Where did you cruise to?! I plan on updating way more often. Typically every Wednesday for "Weight Loss Wednesday" but today I dropped the ball so I will be updating on Friday! Thank you so much for your support! Thank you Meredith! I so appreciate your support and you hosting the linky party! You are awesome! I am in love with this idea!! We recently decided that we will be going to Disney around the beginning of 2014 when our daughter (on the way) is 1 and my oldest is 3.5. This is a great way to save and also a great incentive for me to lose some baby weight! I think I'll be going to get the supplies tomorrow :) Where can you get vinyl & transfer tape? Would Michaels have it? How fun! I love anything disney! You can get the vinyl and transfer tape online. I get mine from MyVinylDirect.com or you can totally find it at Hobby Lobby, Michaels or JoAnn's even! Good luck! Let me know how it turns out! If you make one I'd love to give you a shout out! I love my Disney Stache!!! Jess, you are amazing! I am so very sorry it took me so long to get it to you! This is such a clever & just plain AWESOME jar your created!! As a Disney fanatic I LOVE IT!! What a fantastic motivator in your journey towards reaching your goal!! Brenda, I'm so glad that you stopped by! You seriously NEED to take a Disney Cruise, they are to die for and I go through withdrawals often! I'm seriously thrilled that you came by for our linky party! I've been SLOW at posting lately but I'm trying to be better. I will definitely have to come over and visit! If you look at my sidebar, one of my friends has a blog devoted to all things Disney called "Love Our Disney". You should totally check her out! Aww thanks Tausha. Isn't Disney a wonderful language to speak?! Thank you so much for your amazing support. You are seriously such an awesome inspiring person. I just love you! My family decided that if everyone in the family can lose ten pounds before Christmas, we will start planning a trip to Disney World and then another ten pounds by Spring Break to book specific meals and activities we want to do. It has been two days since deciding that, but we are totally kicked into gear because my husband and I both did the Disney College Program and lived there. We really want to go back. So I loved that you had a similar plan as we did.